Ink converters are an alternative to using cartridges allowing the use of bottled ink by means of a system to draw ink into a holding tank. The earlier converters use a small flexible bladder that is squeezed out to expel the air before being released to draw the ink up into it. Later versions use a piston system or a slide system to draw the ink up. 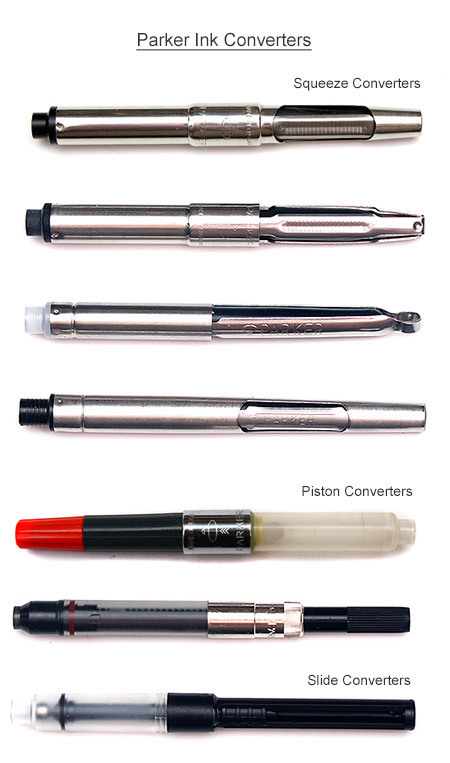 All though there are visual differences between models the basic fitting at the mouth of the converter is standardised throughout the range, so for example a modern slide piston converter will fit an older pen. Having said that not all converters will fit all pens, usually due to barrel or section width problems. For example an older squeeze converter from a early Parker 75 does not fit a modern Parker Vector as the converter is too wide to fit the barrel of the Vector. However a modern slide converter will fit the Vector and the Parker 75. During the late 1960's (early 1968) until the mid to late 1970's Parker introduced a Pencil Cartridge designed to fit into any push button ballpoint pen. These came pre-filled with leads and had the words "Ends Messy Lead Handling" printed on them which meant that most people would throw them away when they ran out and buy a new one - rather like the ballpoint refills. In actual fact they can be refilled simply by pressing the end button to open up the jaws that hold the lead, and new leads fed in to the front. However Parker used a non-standard lead size of 0.040 Inches (1.01mm) perhaps as a way of making it harder to refill rather then then buying a whole new cartridge. They are basically the same size and shape of a standard Parker ballpoint refill, but have the words Parker Cartridge Pencil Refill Ends Messy Lead Handling Made In The USA printed on them, as well as the lead colour (usually black) and the softness of the lead (Firm, Medium, Soft). In the UK these are quite often found bundled with the early Parker 25 Ballpoint Pens although they will fit any push button Parker ballpoint. 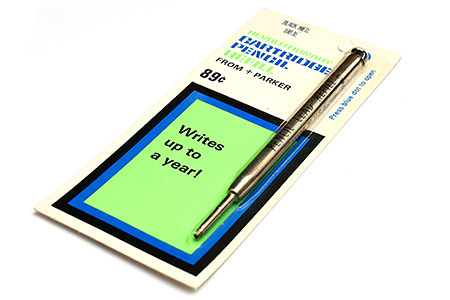 "Revolutionary Cartridge Pencil Refill From Parker" in it's original packaging with instructions for use on the back. 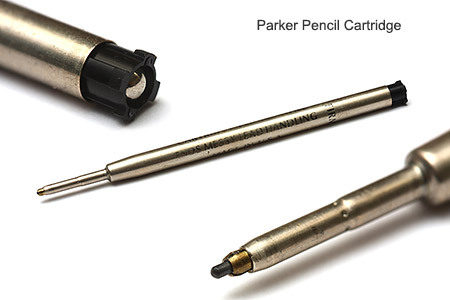 Modern users of the Parker Cartridge Pencil face a problem finding leads to fit these days as 0.040 inch leads are no longer made. The closest are 1mm which can be hard to source although at the time of writing this Rotring sell a 1mm HB pencil lead in Europe. Other users have found that the easily available 0.9mm leads will work but have a tendency of dropping out if you try to advance the lead by pushing the button. Simply make sure that there is something in front of the lead as you push so it can only drop a small amount. Some people wax or Shellac their 0.9mm leads to build them up a little but care must be taken not to over do it. As a word of warning we found that the 1.1mm leads from Yard O Led drop in okay but then will not feed out and will block the pencil, so try at your own risk.